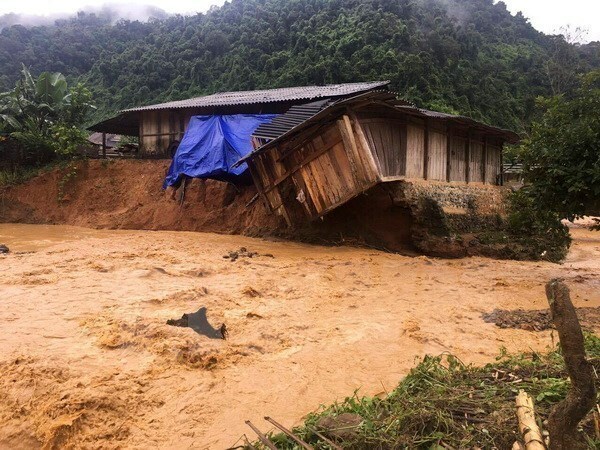 Vientiane (VNA) – The Vietnamese Embassy in Laos and other agencies of Vietnam in the country have raised a fund worth 2,300 USD in support of flood victims in the homeland. Minister-Counsellor of the Vietnamese Embassy in Laos Nguyen Thanh Tung handed over the donation to Tran Thanh Man, President of the Vietnam Fatherland Front (VFF) Central Committee, in Vientiane, Laos, on August 12. The fund aims to help people in northern mountainous provinces hit by the recent floods promptly overcome consequences of the natural disaster and stabilise their lives, Tung said. VFF President Man said the flooding has caused great human and property losses in the localities. The Vietnamese community in Laos is also implementing a range of activities to assist the flood victims at home. According to the Central Steering Committee for Natural Disaster Prevention and Control, by August 7, heavy rains and flash floods had claimed 26 lives and left 15 others missing and 27 injured. About 230 houses had been swept away or collapsed while 245 others had been damaged and 340 hectares of rice had been submerged by floodwater. Nearly 400 households had had to leave their homes to safer places.